It sounds as if the band had a lot of fun making this album. Now it’s your turn to enjoy it !" 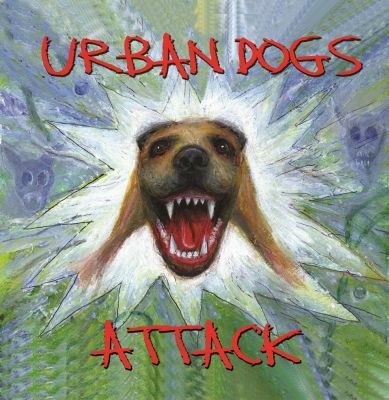 Apart from the fairly recent ‘acoustic’ album, this is the first full-on Urban Dogs album for quite a long time, but it still sounds as confident and natural as a band who were playing and recording on a much regular basis. Still featuring the original four members (Charlie Harper and Alvin Gibbs from the Subs, Knox of the Vibrators and Matthew Best (who has also played drums for Psychic TV in his time…) they obviously have a real chemistry, both as friends and musicians because this comes together in a very organic style, rather than sounding like a disjointed, occasional project. To a certain extent, I expect it is an outlet for songs that may not be appropriate for their regular bands, but the way they all play together make it something unique and valid. Charlie starts the proceedings with ‘Dancing on the Heads of Snakes’, a great, hard-rockin’ song that could’ve easily come from one of Iggy’s better solo albums. Knox then provides a cool contrast with his ‘Little Song’, which is all about the melody and the gentle sentiments of the lyrics. Alvin gets in on the act with ‘Sidewalk Baby’, a Dolls-style stomper that bounces along with an insistent tune and contagious chorus. The band cover different styles, from punk through to blues via glam and pop, and introduce both harmonica and keyboards to bring out further character in the songs. As with their earlier records, there are several covers – the perennial ‘Stepping Stone’ and a wonderful ‘You Can’t Put Your Arms Around A Memory’, adapted in their own way rather than just trying to replicate Thunders’ masterpiece. The finale comes with Charlies’ excellent ‘Whisky Song’, which ends the album on a more sombre, emotive, but also very melodic tone. It sounds as if the band had a lot of fun making this album. Now it’s your turn to enjoy it !